Up to the age of thirty, Schumann concentrated almost exclusively on the piano, composing virtually all the solo works for which he is famous in the single decade from 1830 to 1839. But in 1840, the year in which he finally married Clara Wieck following a protracted legal battle with her father, Schumann branched out into the realm of song. That year saw an extraordinary outpouring of Lieder, as though in rapturous greeting to his bride. 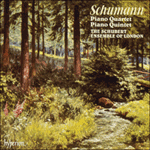 Some 250 were written in those twelve months alone—a body of work that is sufficient in itself to place Schumann as second only to Schubert in the pantheon of song composers. In the following year, Schumann made his first serious attempts to master the art of composing for orchestra, completing his first two symphonies (the second of them was later revised, and published as his No 4), as well as an Overture, Scherzo and Finale, and the first movement of what would eventually become his Piano Concerto in A minor. Only with this experience behind him did he turn his attention to chamber music, in 1842. As things turned out the first half of Schumann’s chamber year was not productive. This was altogether not an easy time for him and Clara: the conflicting demands of their respective professional lives were hard to reconcile, as is shown by an ill-fated tour on which they embarked in February. Schumann was clearly in a depressed state of mind, and had complained of feeling unwell before they left. (Day after day his diary entries contain the single word ‘krank’ (‘ill’), occasionally followed by the confession of a heavy bout of drinking.) In the event he returned to Leipzig after only three weeks, claiming that he could no longer neglect the Neue Zeitschrift für Musik (the journal of which he was Editor), and leaving Clara to continue her travels, which took her as far as Copenhagen, until the end of April. Of the two musicians, it was she who was constantly in the limelight. She was still in her early twenties, but was already an internationally fêted keyboard virtuoso who, as a child prodigy, had counted such figures as Mendelssohn, Chopin and Paganini among her admirers. No doubt Clara could have eased such tension as there may have been between herself and her husband during her 1842 tour by making a point of performing his music, but the fact is that she had very little of it in her repertoire, and chose instead other contemporary composers: Adolph Henselt, Mendelssohn and Liszt. Schumann was represented only by a single number from his Noveletten Op 21 (a collection dedicated to Henselt). However, Clara more than made amends in later years, and there was probably no single composition of her husband’s she performed more often than the Piano Quintet in E flat major Op 44, which has remained by far his most popular chamber work. 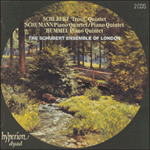 During the Schumanns’ tour of Russia, in the early months of 1844, Clara played the Quintet repeatedly. On the first occasion, in Riga, after a night during which the couple had been kept awake by a party held on the floor above by the notorious courtesan Lola Montez, Clara noted in their marriage diary: ‘Matinee at Löbmann’s where I played Robert’s Quintet, which didn’t go especially well, however.’ Nor was she any more pleased with her subsequent performances of the work, one of which, she said, ‘went miserably’. Schumann’s early biographer Frederick Niecks even recounts an incident at a music-party which found Clara having to suffer the indignity of playing the Quintet while her husband beat time on her shoulder, to prevent her from hurrying. The Quintet’s opening theme, with its wide-skipping melodic intervals, gets the work off to an exhilarating start, and one that provides the ideal foil to the movement’s second subject—a series of smoothly ascending and descending scales, passed from one instrument to another. The two themes provide the fabric of the entire piece, though neither actually features in what is perhaps its most strikingly original moment, which occurs immediately following the repeat of the movement’s first stage, and before the central development section can get under way in earnest. Here, Schumann introduces a mysterious passage in the minor—a series of slow descending scales punctuated by stabbing discords that seems curiously out of place in its context. It seems to have escaped the notice of commentators on the work that the same passage occurs in the slow movement, as a means of linking the first reprise of the march-like main theme with the agitated episode that follows it. In other words, what we hear at this point in the first movement is essentially a flash-forward. There are similar long-range anticipations from one movement to the next to be found elsewhere in Schumann: the slow introduction to the F sharp minor Piano Sonata Op 11 contains a melody that turns out to form the substance of the second movement; the coda of the scherzo in the late Violin Sonata in D minor Op 121 introduces a grandiose chorale that provides a pre-echo of the slow movement’s delicate theme; and in the closing bars of the ‘Spring’ Symphony’s Larghetto second movement the trombones solemnly intone an idea that foreshadows the theme of the scherzo that follows. Schumann’s notion of momentarily throwing a window open onto a later stage of the work is one that left an indelible mark on Mahler, whose symphonies frequently carry out a similar procedure. The Quintet’s second movement is not quite a funeral march—its tempo is not broad enough for that—but it nevertheless conjures up a picture of a procession advancing with faltering steps. The various appearances of the march theme itself alternate with contrasting episodes, in the first of which, taking the music into the major, the violin unfurls a broad and expressive theme while the piano traces its outline in shadow. The second episode is dramatic and agitated, and by a remarkable stroke the viola enters with the main march theme before the turbulence of the episode has subsided. The glittering Scherzo has rushing scales in both directions, punctuated by full-blooded chords. Schumann writes not one trio section, but two—the first offering a gentle canon between violin and viola, and the second being much more agitated, and fully scored. Perhaps the first trio’s undemonstrative counterpoint is Schumann’s means of preparing the listener for the more spectacular contrapuntal writing of the finale. The notion of lending weight to the finale by setting its entire first stage not only in the minor, but also in a ‘foreign’ key is one that Schumann could have learned from Mendelssohn’s early String Quartet Op 12—another work in the key of E flat major with a finale that sets off in a dramatic C minor. At the centre of Schumann’s piece, the assertive main subject is transformed into a quiet fugue theme, with a ‘tripping’ countersubject. 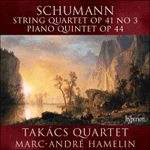 This, it turns out, is a harbinger of the movement’s climax, where the music at last settles in the home key, and Schumann pulls out of his hat a double fugue whose two strands are formed by the main subjects of the Quintet’s first and last movements. It would be hard to think of a previous instance of a composer managing to combine the themes of his two outer movements in this way, and as a means of gathering the threads of the work together, and propelling it towards its exultant conclusion, it could hardly be bettered. Jusqu’à l’âge de trente ans, Schumann se concentra presque exclusivement sur le piano, rédigeant dans la seule décennie 1830–1839 la quasi-totalité des œuvres solo qui font sa renommée. Mais en 1840, il put enfin épouser Clara Wieck (dont le père l’avait entraîné dans une interminable bataille juridique) et se lança dans le lied. Cette année-là fut pour lui celle d’un extraordinaire jaillissement de lieder, comme un accueil enthousiaste fait à la jeune mariée: il en écrivit quelque deux cent cinquante qui suffisent à le placer juste derrière Schubert au panthéon des compositeurs de lieder. L’année suivante, il s’essaya sérieusement à maîtriser l’art de la composition orchestrale: il acheva ses deux premières symphoniques (la seconde sera révisée puis publiée sous le no 4), une Ouverture, Scherzo et Finale, mais aussi le premier mouvement du futur Concerto pour piano en la mineur. Et ce fut seulement après avoir engrangé cette expérience qu’il se tourna vers la musique de chambre, en 1842. La première moitié de cette année «musique de chambre» s’avéra improductive, et les choses furent tout sauf aisées pour Clara et lui: ils peinèrent à concilier les exigences conflictuelles de leurs vies professionnelles respectives, comme l’atteste la funeste tournée entreprise en février. Clairement dépressif, il se plaignit d’être souffrant dès avant le départ. (Aux entrées de son journal intime, un seul mot: «krank» («malade»), parfois suivi de l’aveu d’une solide beuverie.) Finalement, il rentra à Leipzig après trois petites semaines, arguant de ce qu’il ne pouvait négliger plus longtemps la Neue Zeitschrift für Musik (le journal dont il était l’éditeur); Clara, elle, ne rentra pas de ses voyages, qui l’emmenèrent jusqu’à Copenhague, avant la fin du mois d’avril. Des deux, c’était elle qui occupait constamment le devant de la scène. À vingt ans un peu passés, elle était déjà une virtuose du clavier partout fêtée et, dans son enfance prodige, Mendelssohn, Chopin et Paganini avaient été de ses admirateurs. Durant cette tournée, nul doute qu’elle aurait pu apaiser les tensions avec son mari en tenant à jouer sa musique à lui, mais le fait est qu’elle en avait fort peu à son répertoire, tourné vers d’autres compositeurs contemporains, Adolph Henselt, Mendelssohn et Liszt. Schumann, lui, n’était représenté que par un seul numéro de ses Noveletten op. 21 (un recueil dédié à Henselt). Mais Clara fit plus que s’amender par la suite et jamais, peut-être, elle n’interpréta autant une composition de son mari que le Quintette avec piano en mi bémol majeur op. 44, demeuré, et de loin, la plus populaire de toutes les œuvres de chambre schumanniennes. Elle le joua très souvent lors de leur tournée russe, dans les premiers mois de 1844. La première fois, à Riga, après une nuit durant laquelle le couple n’avait pu dormir à cause d’une fête donnée à l’étage par la fameuse courtisane Lola Montez, elle nota dans leur journal de mariage: «Matinée chez Löbmann, où j’ai joué le Quintette de Robert, mais qui n’a pas bien été». Elle ne fut en rien plus ravie de ses exécutions suivantes, dont l’une, dit-elle, «fut misérable». Biographe de la première heure, Frederick Niecks relate même comment, lors d’une soirée musicale, elle s’abaissa à jouer ce Quintette pendant que son mari lui battait la mesure sur l’épaule, pour l’empêcher de se précipiter. Le thème liminaire du Quintette, avec ses intervalles mélodiques à larges sauts, fait décoller l’œuvre sur un début exaltant, parfait repoussoir au second sujet du mouvement—une série de gammes uniment ascendantes et descendantes, passées d’instrument en instrument. Les deux thèmes fournissent le tissu de toute la pièce, même si aucun des deux n’apparaît dans ce qui est peut-être son moment le plus original, juste après la reprise du premier volet du mouvement, avant que le développement central ne s’ébranle pour de bon. Schumann introduit alors un mystérieux passage en mineur, une série de lentes gammes descendantes ponctuées d’accords lancinants qui semblent curieusement hors-contexte. Les commentateurs de cette œuvre n’ont apparemment pas remarqué que, dans le mouvement lent, le même passage vient relier la première reprise du thème principal alla marcia à l’épisode agité qui suit. Autrement dit, ce que nous entendons à cet instant-là du premier mouvement est avant tout un rappel anticipé. De telles anticipations à longue portée, d’un mouvement à l’autre, Schumann en est coutumier: dans la Sonate pour piano en fa dièse mineur op. 11, l’introduction lente renferme une mélodie qui s’avère former la substance du deuxième mouvement; dans la tardive Sonate pour violon en ré mineur op. 121, la coda du scherzo introduit un grandiose choral qui fait un pré-écho au délicat thème du mouvement lent; et dans les mesures conclusives du deuxième mouvement Larghetto de la Symphonie «Printemps», les trombones entonnent solennellement une idée qui préfigure le thème du scherzo suivant. Cette manière schumannienne d’ouvrir une fenêtre sur un pan ultérieur de l’œuvre marquera à jamais Mahler, dont les symphonies utilisent souvent un procédé similaire. Le deuxième mouvement du Quintette n’est pas tout à fait une marche funèbre—son tempo n’est pas assez ample pour cela—, mais il fait surgir l’image d’une procession avançant à pas chancelants. Les diverses apparitions du thème de marche alternent avec des épisodes contrastés dans le premier desquels (la musique passe en majeur) le violon déploie un large thème expressif cependant que le piano dessine son profil dans l’ombre. Le deuxième épisode est dramatique, agité et, par un coup remarquable, l’alto entre avec le thème principal alla marcia avant que la turbulence de l’épisode ne se soit dissipée. L’étincelant Scherzo présente de tempétueuses gammes ascendantes et descendantes, ponctuées d’accords virulents. Schumann écrit non une mais deux sections en trio, la première offrant un doux canon entre le violon et l’alto, quand la seconde, bien plus agitée, s’adresse à tous les instruments. Le contrepoint peu démonstratif du premier trio permet peut-être à Schumann de préparer l’auditeur à l’écriture contrapuntique plus spectaculaire du finale. Cette façon de donner du poids au finale en en mettant tout le premier volet et en mineur et dans un ton «étranger», Schumann a pu l’apprendre du jeune Mendelssohn et de son Quatuor à cordes op. 12, lui aussi en mi bémol majeur et doté d’un finale amorcé en un saisissant ut mineur. Au cœur du Quintette de Schumann, l’offensif sujet principal est métamorphosé en un paisible thème de fugue au contre-sujet «trébuchant». Voilà qui annonce l’apogée du mouvement, où la musique s’installe enfin dans la tonalité principale; Schumann tire alors de son chapeau une double fugue dont les deux composantes sont les sujets principaux des premier et dernier mouvements du Quintette. On ne voit guère qui, avant lui, aurait réussi à combiner ainsi les thèmes de ses deux mouvements extrêmes—difficile de faire mieux pour toronner les fils de l’œuvre et la propulser vers son exultante conclusion. Bis zu seinem dreissigsten Lebensjahr konzentrierte sich Schumann fast ausschließlich auf das Klavier und komponierte innerhalb eines einzigen Jahrzehnts, von 1830 bis 1839, mehr oder weniger alle Solowerke, für die er bekannt ist. 1840 aber, in dem Jahr, in dem er endlich Clara Wieck nach einem langwierigen Rechtsstreit mit ihrem Vater heiratete, erweiterte er sein Arbeitsfeld auf das Reich der Lieder. In diesem Jahr flossen ungewöhnlich viele Lieder aus Schumanns Feder, wie ein begeisterter Gruß an seine Braut. Allein in diesen zwölf Monaten entstanden ungefähr 250—ein in sich selbst ausreichendes Werkkorpus, um Schumann einen nur von Schubert übertroffenen Platz im Pantheon der Liederkomponisten zu sichern. Im darauf folgenden Jahr unternahm Schumann seine ersten ernsthaften Versuche, die Kunst des Komponierens für Orchester zu meistern. Er schloss seine ersten zwei Sinfonien (die zweite wurde später überarbeitet und als Nr. 4 veröffentlicht) sowie die Komposition Ouvertüre, Scherzo und Finale als auch den ersten Satz des später zu seinem Klavierkonzert in a-Moll kristallisierenden Werkes ab. Erst mit dieser Erfahrung wandte sich Schumann 1842 der Kammermusik zu. Die erste Hälfte von Schumanns Kammermusikjahr sollte sich nicht als produktiv erweisen. Er und Clara hatten es zu jener Zeit nicht gerade leicht: Die konträren Anforderungen ihres jeweiligen Berufslebens waren schwer miteinander zu vereinbaren, wie das bei einer unglückseligen Tournee deutlich wurde, die Robert und Clara im Februar begannen. Schumann befand sich eindeutig in einem depressiven Zustand und hatte sich schon über Unwohlsein beklagt, bevor sie die Tournee antraten. (Immer wieder taucht in seinen Tagebucheintragungen das einzige Wort „krank“ auf, gelegentlich gefolgt vom Eingeständnis eines schweren Zechgelages.) Letzten Endes kehrte Schumann nach nur drei Wochen nach Leipzig zurück, mit der Behauptung, er könne die Neue Zeitschrift für Musik (dessen Redakteur er war) nicht länger vernachlässigen. Er ließ Clara ihre Tournee fortsetzen, die bis nach Kopenhagen führte und Ende April dauerte. Von den beiden Musikern war es Clara, die ständig im Rampenlicht stand. Sie war gerade etwas über zwanzig Jahre alt, aber schon eine international gefeierte Klaviervirtuosin, die als Wunderkind solche Persönlichkeiten wie Mendelssohn, Chopin und Paganini zu ihren Bewunderern zählte. Zweifellos hätte Clara solche Spannung, wie sie zwischen ihr und ihrem Mann auf ihrer Tournee von 1842 existiert haben mag, durch eine bewusste Auswahl seiner Musik zur Aufführung entschärfen können. Tatsache ist aber, dass sie davon sehr wenig in ihrem Repertoire und stattdessen andere zeitgenössische Komponisten ausgewählt hatte: Adolph Henselt, Mendelssohn und Liszt. Schumann war nur mit einer einzigen Nummer aus seinen Noveletten op. 21 (eine Henselt gewidmete Sammlung) vertreten. Clara entschädigte jedoch ihren Mann in späteren Jahren mehr als ausreichend, und wahrscheinlich führte sie keine seiner Kompositionen häufiger auf als das Klavierquintett in Es-Dur op. 44, das auch heute noch bei weitem sein beliebtestes Kammermusikwerk ist. Auf der Konzertreise der Schumanns durch Russland in den ersten Monaten des Jahres 1844 spielte Clara das Quintett mehrfach. Beim ersten Mal, in Riga, nach einer Nacht, in der das Ehepaar von einem Fest wach gehalten wurden, das auf der darüber liegenden Etage von der berüchtigten Kurtisane Lola Montez gegeben wurde, notierte Clara in das eheliche Tagebuch: „Matinée bei Löbmann wo ich Roberts Quintett spielte, das aber nicht besonders ging.“ Noch war sie mit ihren darauf folgenden Aufführungen des Werkes zufriedener. Von einer solchen sagte sie, „es ging miserable“. Schumanns früher Biograph Frederick Niecks berichtet sogar von einem Vorfall auf einem musikalischen Fest, bei dem Clara die Demütigung nicht erspart blieb, dass ihr Mann ihr beim Spielen des Quintetts den Takt auf ihre Schulter klopfte, um sie am Eilen zu hindern. Das einleitende Thema des Quintetts mit seinen weit springenden melodischen Intervallen versetzt das Werk in Erregung und liefert damit einen idealen Kontrast für das zweite Thema des Satzes—eine Reihe geschmeidig auf- und absteigender Tonleitern, die von einem Instrument zum anderen gereicht werden. Die zwei Themen bilden das Gewebe des gesamten Stückes, auch wenn eigentlich keines der beiden in dem wohl auffällig originellsten Moment auftaucht, der unmittelbar nach der Wiederholung des ersten Satzteiles und vor dem richtigen In-Gang-Kommen des zentralen Durchführungsabschnitts erklingt. Hier stellt Schumann eine mysteriöse Passage in Moll vor—eine Reihe langsam absteigender Läufe, die von stechenden und in ihrem Kontext scheinbar merkwürdig bezugslosen Dissonanzen punktiert werden. Kommentatoren des Werkes scheinen übersehen zu haben, dass die gleiche Passage im langsamen Satz als ein Mittel zur Verknüpfung der ersten Wiederholung des marschartigen Hauptthemas mit der darauf folgenden erregten Episode vorkommt. Mit anderen Worten, was man an dieser Stelle im ersten Satz hört, ist im Wesentlichen eine Vorausschau. Auch in anderen Werken Schumanns gibt es ähnlich weit gespannte Vorwegnahmen von einem Satz in einem anderen: Die langsame Einleitung zur Klaviersonate in fis-Moll op. 11 enthält eine Melodie, die sich als Kern des zweiten Satzes herausstellen soll; die Koda des Scherzos in der späten Violinsonate in d-Moll op. 121 stellt einen grandiosen Choral vor, der das delikate Thema des langsamen Satzes vorwegnimmt; und in den abschließenden Takten des mit Larghetto überschriebenen zweiten Satzes aus der „Frühlingssinfonie“ stimmen die Posaunen feierlich einen Gedanken an, der das Thema des darauf folgenden Scherzos andeutet. Schumanns Idee, den Blick vorübergehend auf eine spätere Phase des Werkes freizugeben, hinterließ eine unverkennbare Spur bei Mahler, in dessen Sinfonien häufig ein ähnliches Verfahren zur Anwendung kommt. Der zweite Satz des Quintetts ist nicht ganz ein Trauermarsch—sein Tempo ist dafür nicht breit genug—doch er beschwört nichtsdestotrotz das Bild eines sich mit zögernden Schritten nähernden Menschenzugs. Das Marschthema selbst taucht in verschiedenen Erscheinungen auf und alterniert mit kontrastierenden Episoden. In der ersten von diesen, in der sich die Musik nach Dur wendet, entfaltet die Violine ein breites und expressives Thema, dessen Gestalt vom Klavier schattenhaft nachgezeichnet wird. Die zweite Episode ist dramatisch und erregt, und dank eines bemerkenswerten Einfalls setzt die Viola mit dem marschartigen Hauptthema ein, before die Turbulenz der Episode abflaut. Das funkelnde Scherzo enthält hastige Läufe in beide Richtungen, die von vollblütigen Akkorden markiert werden. Schumann komponierte nicht einen, sondern zwei Trioabschnitte—der erste bietet einen sanften Kanon zwischen Violine und Viola, der zweite ist viel erregter und voll orchestriert. Vielleicht stellt der reservierte Kontrapunkt des ersten Trios ein Mittel Schumanns dar, den Hörer auf das spektakulärere kontrapunktische Gewebe des Schlusssatzes vorzubereiten. Der Einfall, dem Schlusssatz ein stärkeres Gewicht zu verleihen, indem man dessen gesamten ersten Teil nicht nur in Moll, sondern auch in einer „fremden“ Tonart komponiert, könnte Schumann aus Mendelssohns frühem Streichquartett op. 12 gelernt haben—auch ein Werk in der Tonart Es-Dur mit einem Schlusssatz, der mit einem dramatischen c-Moll beginnt. Im Herzen von Schumanns Stück wird das selbstbewusste Hauptthema in ein leises Fugenthema verwandelt und von einem „trippelnden“ Kontrapunkt begleitet. Wie es sich herausstellen soll, ist das eine Vorankündigung des Satzhöhepunkts, wo sich die Musik endlich in der Grundtonart etabliert und Schumann aus seinem Hut eine Doppelfuge zaubert, deren zwei Stränge von den Hauptthemen des ersten und letzten Satzes des Quintetts gebildet werden. Es gibt wohl kaum ein früheres Beispiel für einen Komponisten, dem es gelang, die Themen seiner zwei Außensätze auf diese Weise miteinander zu kombinieren; und als ein Mittel zur Bündelung der Werkstränge und als Triebkraft für den jubelnden Abschluss könnte diese Verknüpfung kaum besser sein.